While you could play Flac files on Windows using a third-party program like VLC, in an upcoming release of Windows 10, it will support the format natively. If you’re an audio enthusiast, you already know the benefit of having Flac files. FLAC stands for “Free Lossless Audio Codec” and provides better audio quality for your ripped CDs than compressing them with formats like MP3. The files are quite a bit larger than MP3s, but if you take your music seriously, you can tell the difference in the quality of the music. Flac does reduce the size of a CD to around 60% of its original size without any loss of quality of the original. 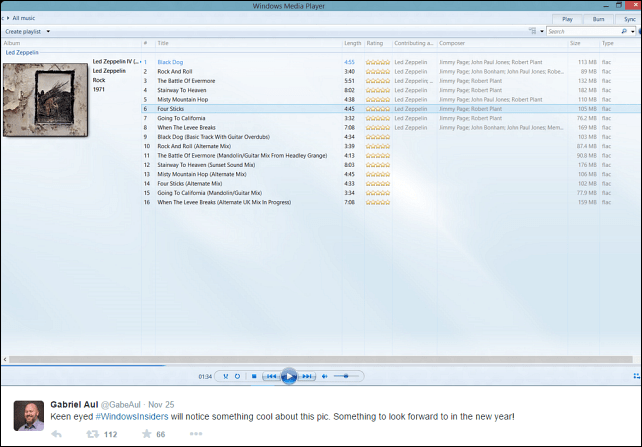 Gabe Aul, who is one of the heads of the Windows Insider program for Windows 10 tweeted the following picture of a future version of Windows 10 that shows Flac files being played in Windows Media Player. A couple of years ago, I showed you how to play Flac Files on Xbox 360 by Streaming them from Windows 8 or Android, and, we covered how to play them via Windows Media Center but Flac will now be supported natively, without having to deal with a complicated work around. It’s worth mentioning there are plenty of free programs that will play Flac files like VLC and Foobar2000. Windows 10 now supports MKV video files as well. This is good news for those for those of users who have ripped their Blu-ray and DVD collection to MKV format. While these two formats aren’t hugely popular with the general computing public, video and audiophiles will definitely appreciate this news. Personally, I’ve been using programs like VLC and Foobar2000 for years, and I am not sure if native support of Flac will convince me to stop using them, but it’s something I will definitely be investigating. What I would like to see is a revamp of the Windows Media Player interface since the file formats are supported, but whether or not Microsoft will do that remains to be seen. Wait! There’s a Windows 10 already? I just got a Windows 8.1 desktop p.c. last month. My old Windows Vista desktop died and I got what I thought was the most up to date computer I could find at the time– 8.1.